Want to make a statement in a room but not sure how to do it? Try painting an ascent wall! This wall can be solid color, two tone, striped/patterned, or could have shiplap, wallpaper, or any combination there of. Just be creative and we are confident that you will love the look! Recently, my wife and I painted an ascent wall in our nursery and we couldn’t be happier with the results! Below, we provide a couple of tips in making a painted ascent wall a success! First off, interior latex paints dry to the touch in just a couple of hours, however, they will not fully cure for about 1 week. Rather than waiting a week between paint color applications, use delicate surface painters tape to be sure not to peel up freshly painted walls. For example, in our project, we painted the base color one day, allowed that to dry 24 hours and then taped off the pattern we wanted to create and then painted the second color. The next day, we did the same process again, and we were done! In just 3 days, we were able to complete the project and get perfect crisp edges between the colors, thanks to delicate surface painters tape. We stock options from both 3M Scotch and Frogtape when it comes to delicate surfaces. 1. Remove tape by pulling at a sharp angle. This will ensure that the tape does not tear and rip like it often does when peeling quickly at a 90 degree angle. For an example, please reference our image to the right. 2. For the cleanest lines, be sure to remove painters tape once the paint is dry to the touch. The Scotch brand website will recommend to wait about 24 hours, but we feel that this can be expedited to about 12 hours or so. 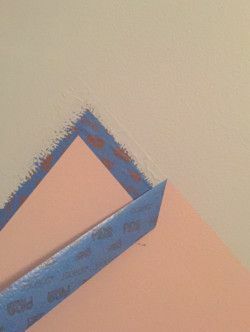 When ready, simply run a putty knife (or utility knife) over the edge to break any bond that the tape might have with the newly painted surface. By removing paint promptly and scoring the edges with a blade, you will help to prevent little chips and imperfections that might result when the tape is removed.